When I was putting together my list homemade gifts for the holiday season I knew I wanted some sort of seasoning mix. Homemade seasoning blends/mixes are so incredibly easy to mix up and usually use spices and dried herbs already found in most spice cabinets. Because of this, they cost pennies to make and are not loaded down with extra sodium, which is often the case with store bought spice blends. 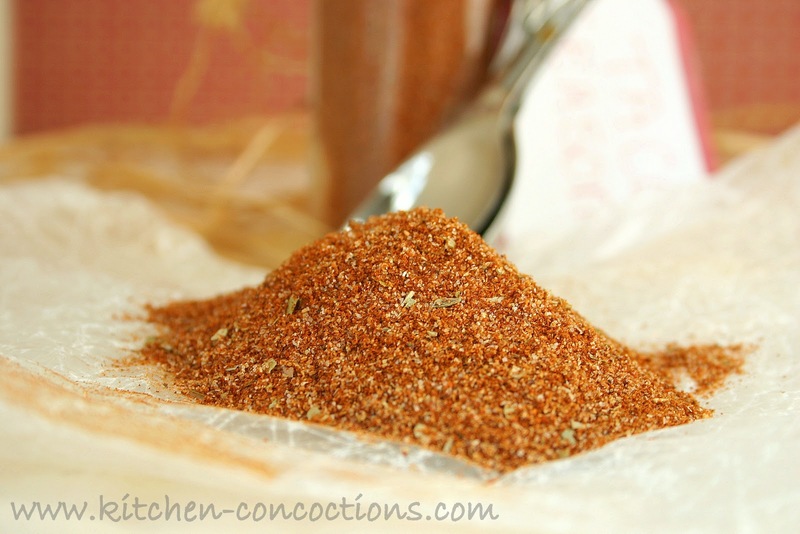 After reviewing previous spice blends I have shared (Poultry Seasoning, Greek Seasoning, BBQ Seasoning), I couldn’t believe that I have never shared my ‘go-to’ Taco Seasoning blend. This is seriously the most used spice blend in my kitchen (hello Taco Tuesday) and one of the most requested recipes I get from friends, family and as part of some work I do monitoring some cooking discussion boards. 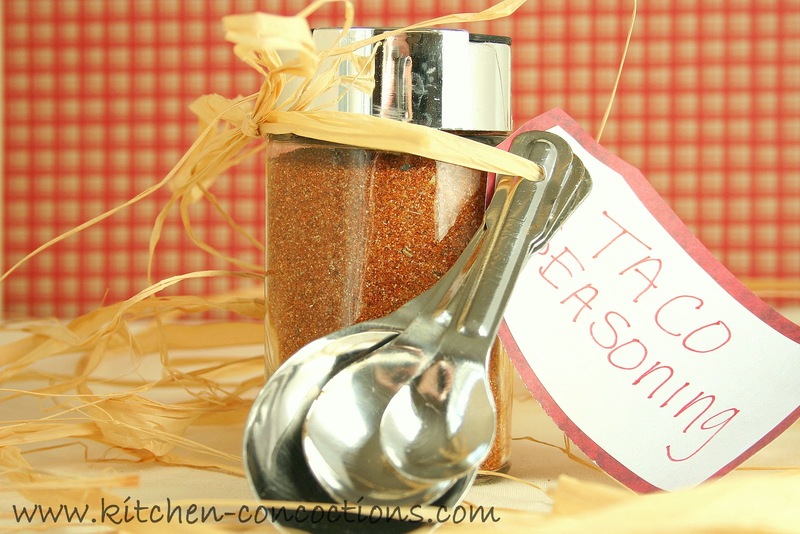 It seems like everyone wants to know how to make homemade taco seasoning, but no one knows how! Well here is the recipe I always use and always share. It uses things I am sure you already have on hand and makes almost a cup of seasoning (which will last you awhile). This is perfect for gifting for the holiday season because it can easily be doubled or tripled and is extremely affordable (all of these spices are usually sold in bulk or in large containers at the grocery store or discount store, like Costco or Sam’s). And did I mention everyone always uses taco seasoning?!? Packaging Suggestion: I have seen spice jars like the one pictured for a dollar or less at the Dollar Store, Walmart, Bed, Bath and Beyond, and even on line. Or you could simply use tiny mason jars as well. You could simply gift the spice blend in a small jar with a festive ribbon wrapped around, but I think tying on some measuring spoons looks cute and adds to the gift. 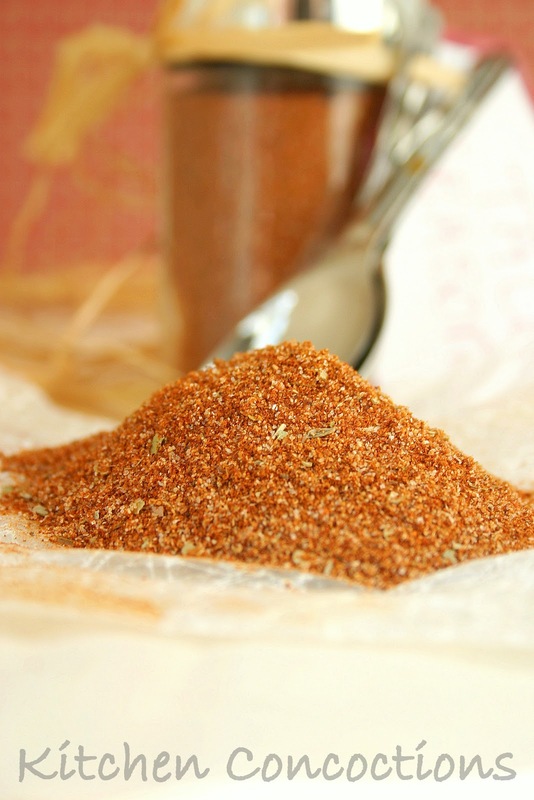 Another idea is to attach the recipe for the taco seasoning (below) or your favorite recipe that uses taco seasoning (here are a few of my favorites: Taco Pizza, Texas Style Chili, Beef ‘n’ Bean Burrito Burgers and Chicken Enchilada Stacker). Combine all ingredients in a small bowl and stir to combine. Store in an airtight container in a cool dark cabinet until ready to use. Note: Use 2 tablespoons to replace one package of taco seasoning in recipes. Or brown ground beef, drain grease. Add 2 tablespoons homemade taco seasoning and ½ cup of water. Let simmer for 10 minutes.